Block Pro® BJ-Progressive is very easy to play and delivers a fun and very rewarding Progressive-bet for traditional Blackjack. The aim of the Progressive-bet is to wager on the outcome of the players first two cards and the Dealer’s up card. 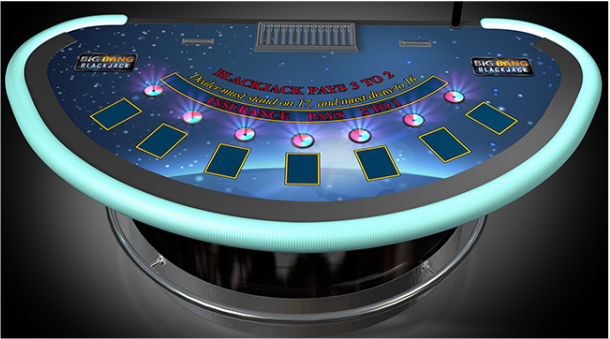 Block Pro® is a Progressive-bet, which may be added to any Blackjack game. The following are the possible wins. Triple Aces: Player’s first two cards, and dealer’s hole card, are all aces of the same suit. Wins pay 100% of the jackpot meter. Triple Royal: Player’s first two cards, and dealer’s hole card, are all the same royal face card (J, Q or K) and the same suit. Wins pay 20% of the jackpot meter. Triple: Player’s first two cards, and dealer’s hole card, are all the same rank of 2-to-10 and the same suit. Wins pay 10% of the jackpot meter. Flush Pair: Player’s first two cards and Dealer’s hole card are all the same suit, and player’s first two cards form a pair. Flush: Player’s first two cards and Dealer’s hole card are all the same suit. Copyright © Stephen Au-Yeung 2019, All rights Reserved.